When it comes to social entrepreneurship and getting your sustainable business started, funding is of course one of the main concerns. In 2017 the international Impact Hub network (15.000 members in over 100 countries) conducted a Global Members Survey enquiring after the support needs of social entrepreneurs: unsurprisingly, it turned out that 45% of the Members “sought support in obtaining financial capital and investment” (Global Impact Report 2018). In this article we highlight the most important sources of funding available for social entrepreneurs in Germany. This can come in the form of awards, prize money, or investment (such as crowdfunding and by VCs). Firstly, while most awards and prizes we could find were open to all sorts of social endeavours, those that do decide to target a specific topic tend to be directed towards renewable energies, climate change and green economy. Secondly, it was also rather unsettling to notice how the german government offers a large number of funds and financing options for start-ups in general, but none of them are specifically targeted to social entrepreneurs: since social businesses face different and arguably harder investment processes, this leaves them at a slightly disadvantaged starting point. After all, if your own government doesn’t believe in giving you a head start, why should regular VCs and investment funds? Nonetheless, a light shines at the end of the tunnel, and it comes from the Berliner Investment Bank (IBB), which just recently made its investment programs available also to social enterprises (although still not exclusively for them). Thirdly, while many funding and award programs target startups in their first development stage, there remains a substantial gap for financing structures between 100 and 300.000€, which can force SEs to continuously apply for funding through different projects, making it difficult for them to reach a sustainable financial solution. One of the few exceptions to this scenario is the Google Impact Challenge, which offers prizes up to 500.000€. Ananda Impact Fund and BonVenture. Two of the leading venture capital investors for impact enterprises and social change in Europe, supporting companies that combine humanity and profitability and contribute sustainably to the resolution of concrete social and ecological problems. FASE. The “Financing Agency for Social Entrepreneurship” connects social entrepreneurs and investors in order to maximize the social impact of outstanding projects through growth financing. Their main impact themes are education, inclusion, ageing population, long-term unemployment, health and sustainable consumption, but they remain open to other high-impact areas, too. Google Impact Challenge. Targeting both local and broader projects, the challenge supports ideas that can improve our society through the help of technology – whether with an app, website or something completely different. Winners receive free training and prizes in the value of 20.000 €, 250.000 € and even 500.000 €. 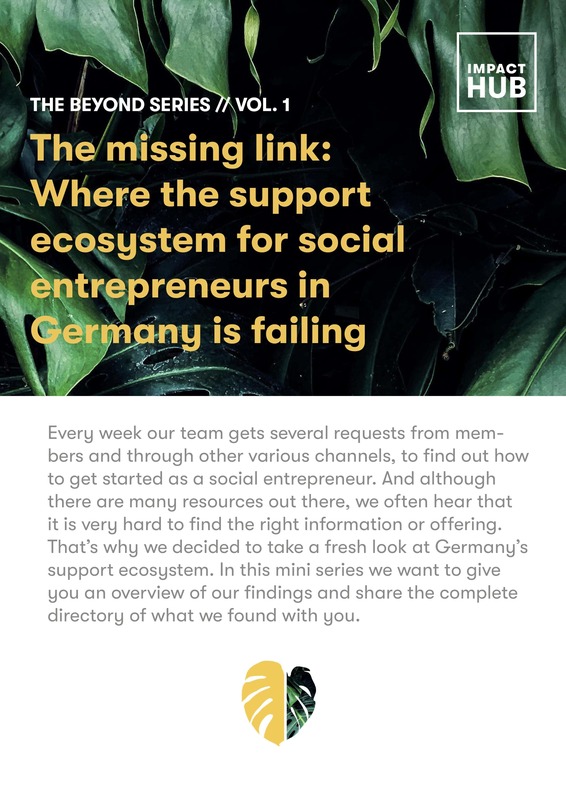 For the moment, we can conclude that while Germany is certainly not barren land when it comes to funding opportunities for social entrepreneurs – it still has some steps to go. Moreover, with neighboring France pouring millions from public and private money into social innovation businesses, we are somewhat left with a feeling of that what has (arguably) been good until now, will not be enough in the future. If sustainable businesses want to be a standard in the future, Germany must indisputably step up its game – ideally paving the way for support solutions where private entities work hand in hand with governmental ones. >> 3 more articles for Volume 1 coming up! Topics will be consultancy, knowledge and connections – check back here again. Please let us know if there are any great offerings we have missed and give us your input! This article is part of our THE BEYOND series – a series we brought to life to take you on a journey beyond the known allies, the countries we live in, the current methods and tools, the new technologies, the digital transformation and the unicorns. Beyond the buzzwords. We’ll be sharing insights, learnings and research from our work and from within our ecosystem. Each volume of THE BEYOND will bring you up to speed about a core topic through a series of articles and a closing event. We want to inspire you to take a look beyond: step out of the framework, identify new opportunities, discuss the challenges of tomorrow and find solutions to create a future that works for all. We are on the transition team – we invite you to be part of it. It’s time to explore BEYOND!